as "Wakasa-nuri". Production here occupies over 80% of lacquered chopsticks in Japan. Beautiful patterns are created by embedding small pieces of abalone shell and fragments of eggshell in layers of lacquer. 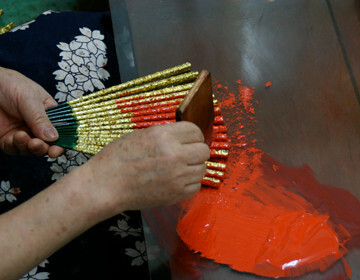 The final design of the chopsticks comes from how the lacquer coatings are carved . 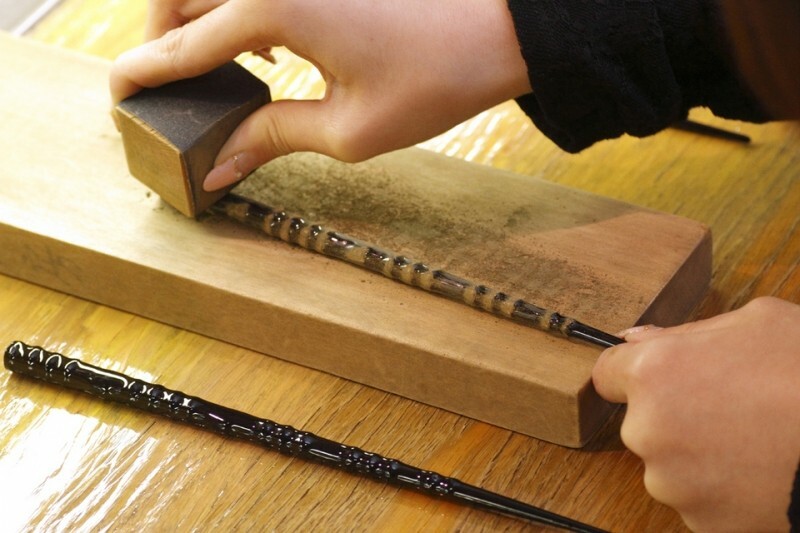 Carving can also determine the final shape of the chopstick. After carving the chopsticks must be carefully polished in order to bring out the beauty and colors of the lacquering pattern. Wakasa chopsticks that are simply polished often have colorful, organic patterns that reveal the many coatings of lacquer and inlaid shell beneath. 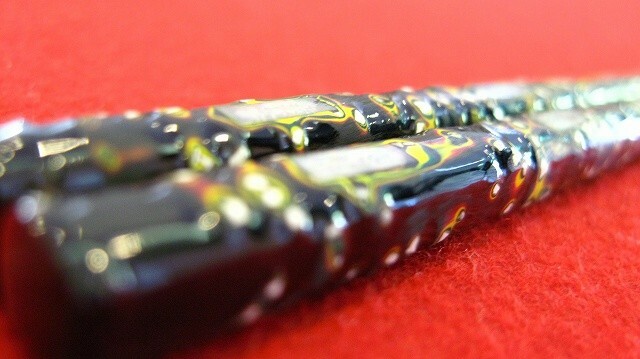 Carved Wakasa chopsticks on the other hand often have wood grain-like patterns that reveal the different colors and fine layers of the many coats of lacquer (as more than 50+ layers of lacquer). Each Wakasa lacquer chopstick is very labor intensive, such a painstaking processes take several weeks to a couple months to complete. Truly every pair is a work of art. Also, gold/silver leaf are repeatedly coated. Such chopsticks in top level can cost up to 20,000 yen (=EUR 150). → more about Japanese Laquerware → about Japanese Lacquerware "Shikki"